The Chief Development Officer at Cisco Systems, Inc, Mario Mazzola, who is also the recipient of the Armenian President’s 2014 prize for global contribution to the information technology (IT) sector, on Tuesday paid a visit to the Armenian Genocide Memorial in capital city Yerevan. 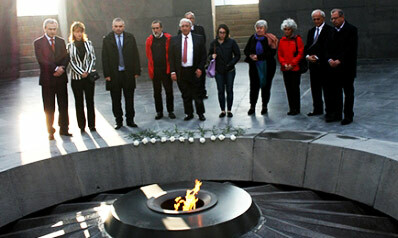 Mazzola and the members of the delegation accompanying him placed flowers at the eternal flame which eternalizes the memory of innocent victims of the genocide, and stood a minute of silence to pay tribute to them. Mario Mazzola also planted a silver fir at the Memory Grove. Subsequently, the delegation toured the temporary exhibition hall at the Armenian Genocide Museum-Institute.